I refer to the article in the LMD Magazine of March 2018, under the caption ‘Grave Threats to Our Pluralism’ by Mr. Jehan Perera and wish to make my observations/comments. When reading the said article between the lines and behind the lines, one is inclined to believe that Jehan supports the cremation of Venerable Meegahajandure Gnanaratana’s in the Jaffna esplanade as an acceptable practice, similar to practice adopted in the south of Srilanka. Further, he states that in view of the ‘protests’ by the Tamils in Jaffna against this cremation, a north- south dialogue is the need of the hour, perhaps to discuss all matters which are a bone of contention between the Sinhalese and Tamils. Yes! But will that bring any desired results. The dialogues have been going on from 1956 on words with no tangible results being achieved. Invariably the talks were aborted half way through or the fragile agreements reached with trepidation, were unilaterally abrogated by the government due to pressure from opposing parties. Mr. Jehan Perera, with his knowledge of worldwide politics, and as the Executive Director of the National Peace Council of Srilanka, may make efforts to initiate a fresh dialogue among all parties with regard to all matters to the dispute. Mr. Jehan Perera is generally considered to be a sober writer and his articles/ views are held in high esteem by most of the readers. They are theoretically good. But could they be implemented in Srilanka? However, in this article under reference he says that “As long as human rights are not violated and the law is followed no cultural practice should be obstructed in any part of the country”. True. But I am sure human rights do not only mean the physical impact but the mental agony too. He seems to subtly justify the funeral arrangement of at the Venerable Meegahajandure Gnanaratana at the Jaffna esplanade, equating it with various religious procession which takes place in Colombo ‘blocking city traffic for hours’. Unfortunately, whether one likes to accept it or not, there was a political and racial undertone in this funeral arrangement and a display of arrogance by the army. This may block the little cordiality existing between the Sinhalese and Tamils, not for hours but for years. 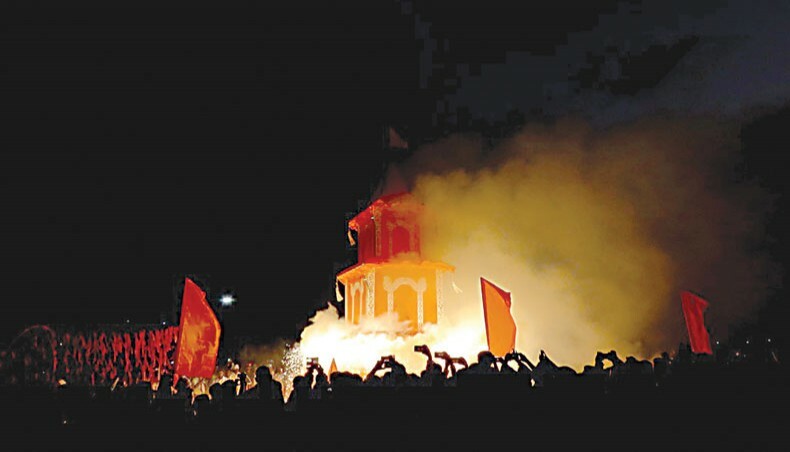 According to my knowledge no ‘Funeral Pyre’ was ever lit at the Jaffna esplanade or any other public places in Jaffna. Exceptions being, the burning of the dead bodies, by the Srilankan army and the IPKF, of those who were killed by them. This Bhikku’s funeral arrangements were sphere headed by the army lead by the commander, who according to Mr. Jehan Perera, have had a long period of service in Jaffna. The commander, with his ‘long period of service in Jaffna’ should have known better about practice and Customs/culture prevailing in Jaffna. Instead he appears to have encouraged his men to threaten the members of the public from organizing any sort of demonstration against the funeral arrangements. Would the army have done it if not for the arrogance displayed after the war? It appears that the army has its last say in all aspects, whether it’s lawful or not. The funeral in Jaffna cannot be taken in isolation. This arrangement should be taken in conjunction with the other Governments/Army activities such as erecting Buddha’s statues in Tamil areas where there are no Buddhists, holding on to the private lands taken over during the war and cultivating the lands belonging to the poor farmers, thus depriving the farmers of their legitimate earnings etc. While writing this article, according to press reports ‘Lord Buddha’ is being used as a tool in creating problem in the Vavunia campus, ‘asking for a priority seat’ for Lord Buddha, despite the fact arrangements are afoot to accommodate all religious activities. Similarly in Maviddapuram and Oddisuddan, Hindu temples are being demolished to make way for Lord Buddha. The takeover of the Navatkuli housing scheme to be given to the Sinhalese brought down from the South and arrangement to build a vihrae there in, without a permit from the local authorities, caused considerable concern for the local population. When this arrogance was challenged at the courts, the magistrate gave a go ahead to build the Vihare on the basis that Buddhism is given the ‘foremost’ place in the constitution. What an interpretation? Similarly the Magistrate who heard the case against the funeral found a way of escapism, despite the fact there is a Hindu temple and memorials to those who were killed in 1974 by the police, during the International Tamil Conference, in the vicinity. This is a dangerous precedent. It will not be surprising, if there is a dispute between the Nagapooshani Amman temple and the Buddhist temple in Ninatheevu (Nagatheepa) irrespective of the rights and wrongs, the Buddhist Temple could have its way as per the interpretation of the of the constitution by the judges. May be, the judges cannot interpret the law otherwise for fear of treading on the toes of the Buddhist Government. Giving Buddhism the foremost place in the constitution could give additional problems with the passage of time. The best and most appropriate place for Monk’s funeral would have been the vicinity of the Nagadeepa Vihara or in its premises itself in Ninateevu, where Buddha himself has supposed to have visited and a main place of worship for the Buddhist military personal, blessed by the Venerable Meegahajandure Gnanaratana from 1991 on words, until his demise. As long as the Tamil live in fear and the racial problem exists as at present, actions of this nature by the government/army will continue to be viewed with suspicion. Finally, I wish to state that I am an Agnostic and consider the practicing religions are the cause of innumerable problems in the world. Unless lord Buddha’s teachings are adhered to in its totality, my contention is that religion is not necessary for man to exist but man is necessary for religions to exist. Winning The Presidential And Losing The Parliamentary?